Jackie Biskupski officially took the reins of Salt Lake City on Monday, pledging to clean the Wasatch Front’s filthy air, promote a more inclusive city and be the kind of mayor who regularly visits with the city’s snow plow drivers and sanitation workers. The former state legislator, who unseated two-term incumbent Ralph Becker to become the city’s first openly gay mayor and second female to lead the city, said she was “honored” to once again be serving the people of Salt Lake City. A key component of improving air quality, which Biskupski took aim at during her campaign, is completing a transit master plan, which she hopes to have in the bag in the coming months. In her speech, Biskupski noted Salt Lake City’s pioneer heritage, calling Salt Lake a “city of opportunity.” Just as the Mormon pioneers found opportunity in Zion, so too did Biskupski. A native Minnesotan, Biskupski came to Utah on a ski trip in the 1980s and never left. She started a business, was elected to the Legislature and, prior to winning the mayor’s seat, worked as an executive administrator in the office of Salt Lake County Sheriff Jim Winder. A key to the city’s future, Biskupski said, is bolstering economic development—an effort that will be aided through creating stable and streamlined planning and permitting processes. “Our city agencies will work together much more closely to promote a culture of customer service so businesses can focus on theirs,” she said. “To secure our future, we must bring focus to our city’s dynamic West Side,” she said. 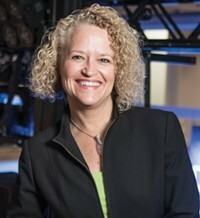 Though the capital city’s mayor has no power over the Salt Lake City School Board, Biskupski promised to “use my voice” on the board to ensure it selects a new district superintendant “who has the cultural competency to provide for all students, the necessary tools to achieve academic success.” Current district Superintendant McKell Withers plans to retire at the end of the present school year. Shortly after the election was certified in mid-November, Biskupski announced that she had requested resignation letters from 34 of the city’s department heads and top employees. It’s not yet clear how many of these employees have left the city, though a call to the city’s Department of Public Utilities on Tuesday revealed that its longtime director, Jeff Niermeyer, is no longer employed by the city. While transitions within city departments are underway, Biskupski’s circle of advisors has been taking shape. Biskupski has hired Patrick Leary, who has held multiple positions within Salt Lake County, including director of the Public Works Department, as her chief of staff. Former state legislator’s David Litvack is Biskupski’s deputy chief of staff and Jennifer Seelig is the mayor’s community relations director. “While I may not get my hands as dirty as some of you, I can assure you this is a hands-together administration,” she said.